So what is with the bones? Truth be told, it is just a silly gimmick that I think is funny. You see, I have always been a big fan of Halloween. 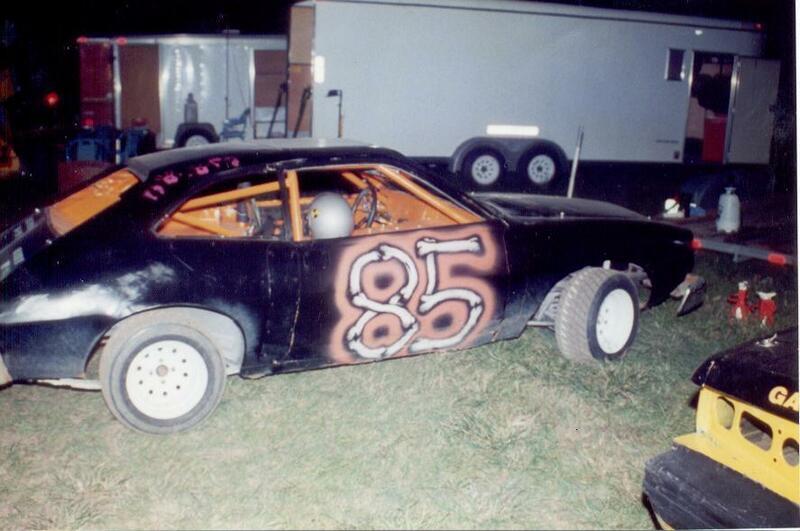 So in 1995, I bought a mini-stock that was painted black and orange, perfect for a Halloween paint scheme! I had some bones air-brushed on and we were off to the races. Then it got worse! 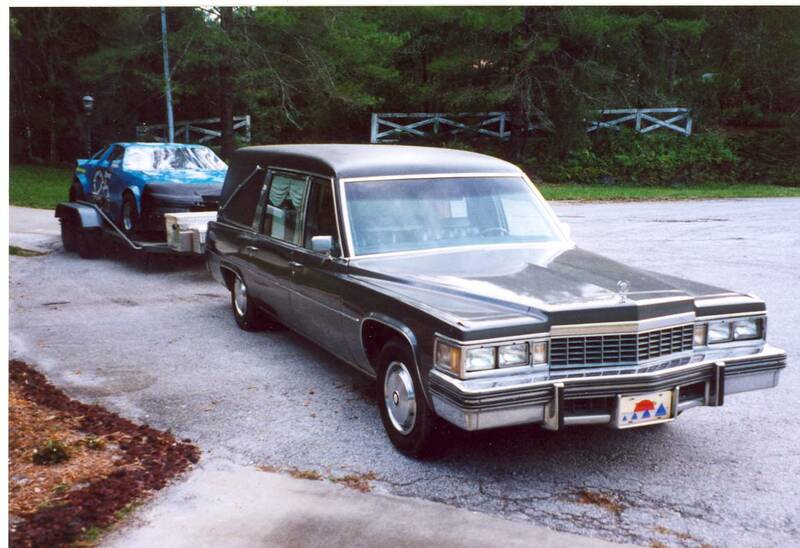 If you mix a gear-head with a Halloween fan, you end up with a guy like me who thinks hearses are cool. 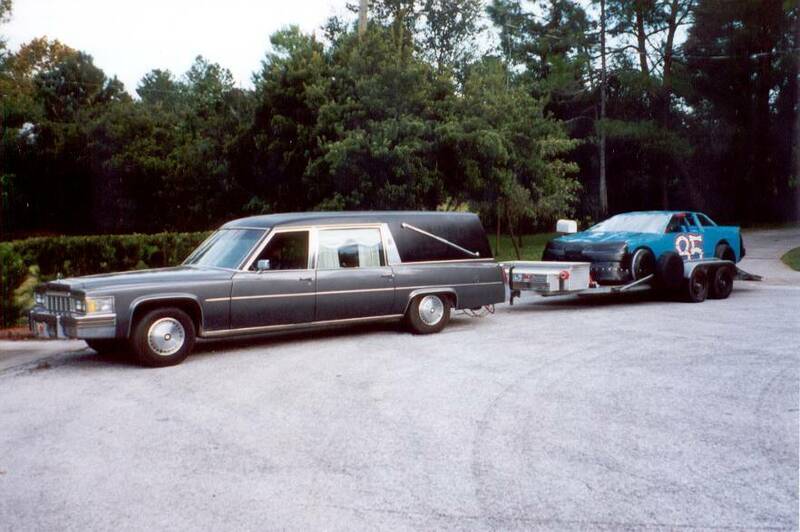 So I bought this hearse in December, 1996. 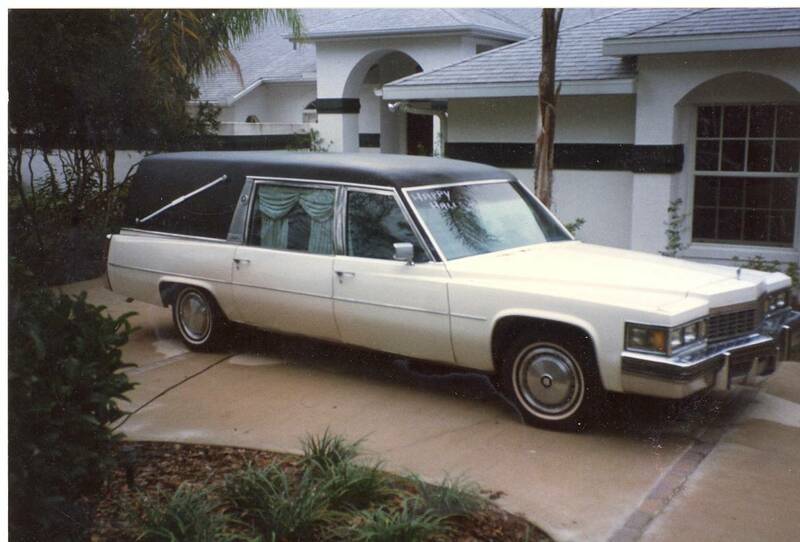 Everyone else wanted to decorate for Christmas, and all I wanted to do was mess with my new Cadillac. 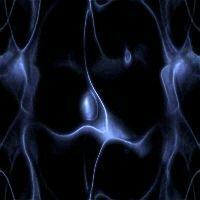 Gorgeous, right? It was in service until just before I got it. This Caddy had a 425, and it ran great. Naturally, I put a trailer hitch on it and used it to pull the racecar trailer. 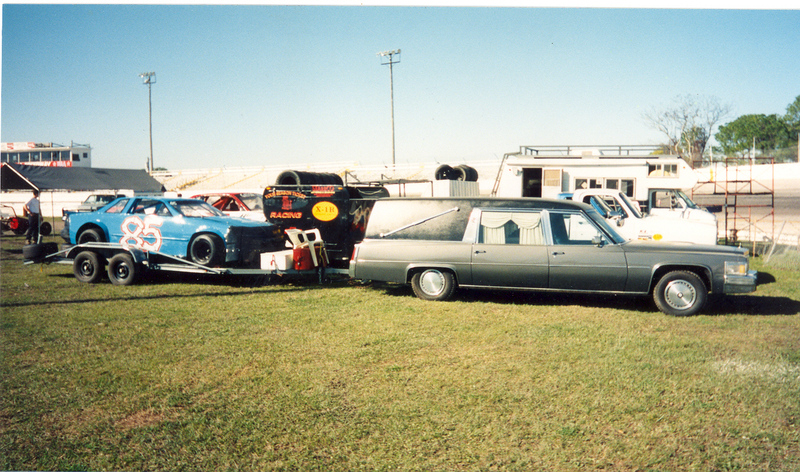 This was taken on the first day I used the hearse to pull the racecar to the track. Everyone laughed when I pulled into the pits. Hey, that is what it was for, to make people happy. 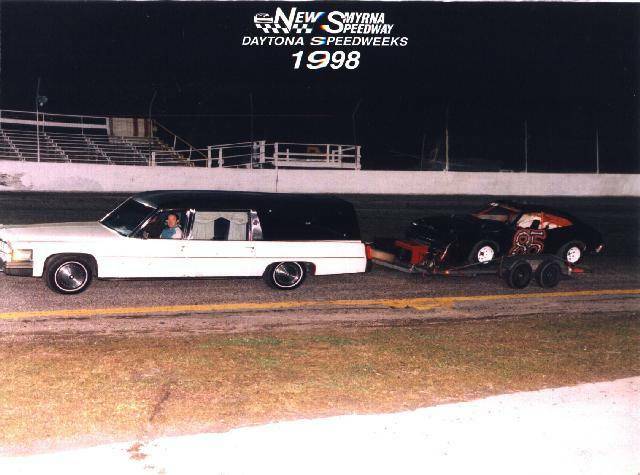 I won the feature that night too! 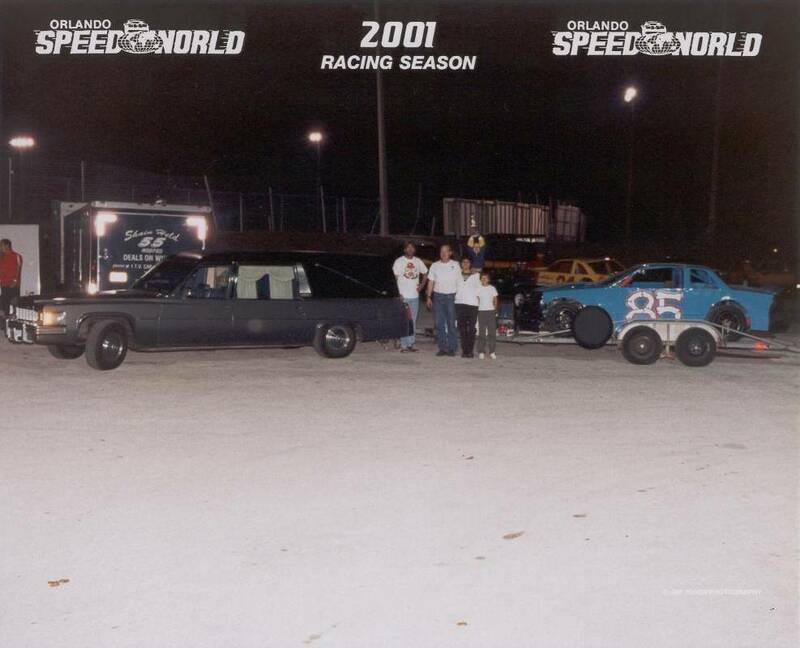 Here we were at New Smyrna one night after racing in the World Series. The Caddy had a rust problem, so I had it fixed and repainted. 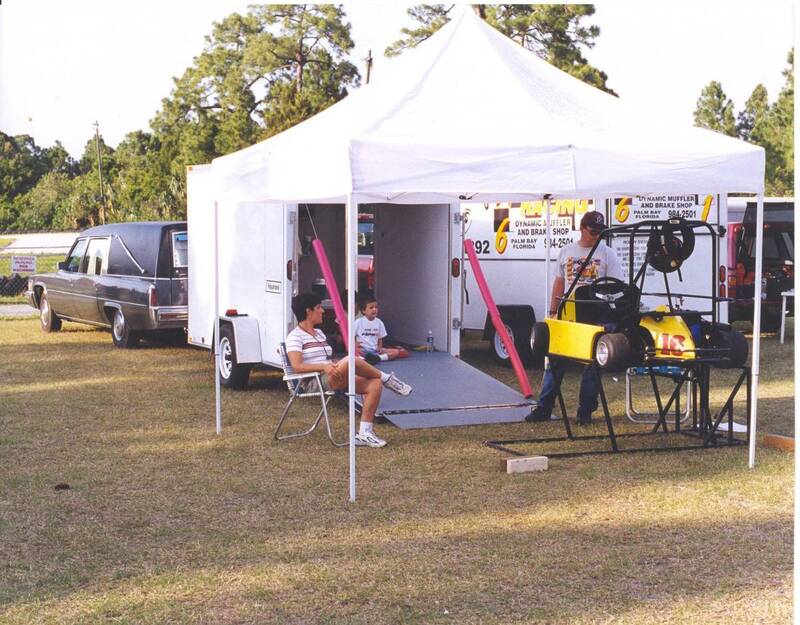 This was a race day at Sharpes Speedway in Cocoa, FL. If you look close, you can see my son holding the trophy! We won on this night in March, 2001. In 1998 and 1999, I started running at the FASCAR tracks. It was the announcer, Dave Westerman, who hung the name "Boneman" on me. It has stuck ever since. When my wife found out that baby #3 was on the way, I decided I didn' t have time to spend maintaining this toy and still race, so I sold the Caddy on eBay, in the spring of 2002. Why # 85? Well, that refers to 1985, which was an exceptional year for me. Everything seemed to go right that year.